(Myth) You will feel the bites: Most people don't notice when being bitten. Reaction after the bite varies from person to person and is delayed. Some do not ever notice. (Myth) People only get bed bugs from motels: You can bring them home in used furniture, visiting guests, and even places like movie theaters. (Myth) Chemicals don't work: Non-repellent chemicals are effective, repellent chemicals can make things worse. Bug bombs can be the worse thing you can do. (Myth) Only dirty people get bed bugs: Clutter will increase the difficulty of finding and treating bed bugs but no one is immune from getting them. 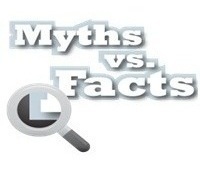 (Myth) They feed every day: Normally a single bed bug does not need to eat every day. If conditions are unfavorable or no one is present, they can go months without a meal. Heat does kill bed bugs but there are pros and cons to consider. Read the discussion on heat below to make up your mind. Call us for advice or an inspection. Bed Bugs have been around man since he lived in caves and are believed to originated from bat bugs. Virtually eliminated by 1940 but have returned. Changes in chemicals and people's habits are believed to be the reason. No longer just in big cities. If you haven't had enough of bed bugs after reading this page this link offers one of the most comprehensive detail we have found. Bed Bug treatment program procedures: Treatment is centered around 2 strategies. The first is a thorough pest control treatment with non-repellant residual chemicals. The second is to use exclusionary measures, traps and monitors to prevent any insects that were in inaccessible areas from gaining access to the resident and reestablishing a population. Both are critical to success. Bed bugs are primarily nocturnal so treatment is centered around those areas where people are when it is dark. However other areas are also treated so these procedures apply to the entire dwelling. The customer must obtain both mattress & box spring encasements which prevent any bed bugs from re-infesting those items. Those can be obtained online or locally. They should be sized to fit snugly. Protect-A-Bed and SafeRest are notable brands. Prices for a bed set ( mattress and box springs ) is about $100. If the current bed set is in good condition, leave it in the room without sheets. If the current bed set has cuts, rips or holes it should be removed and replaced. The encasements should be put on the bed set before treatment. Pillows generally do not need encasements as they can be put in a dryer to kill any bed bugs. In addition, the bed set must be on a frame and not sitting on the floor. If sofas have been slept on and especially if they are in poor condition, consider discarding them. Just like a bad mattress it is impossible to get insects out of a tattered and torn sofa. Heat chambers would work but the cost to do so would be more than the cost of a tattered piece of furniture. Prior to treatment EVERYTHING	has to be taken off the floor except furniture. Do not pile things up on beds, sofas or furniture. Furniture should be moved away from the walls to the center of the room. During the treatment process the clothing and bedding needs to be washed and dried at a laundry and brought back in new plastic bags. If the laundry is already clean then it just needs to be run thru the dryer. Toys and small items are best put in closed bins or plastic bags. In some cases the dressers and night stands need to be emptied and they will be treated. You should plan on being gone for most of the day since the chemicals need to be dry before you re-enter. On return, make sure the bed is on a frame and is several inches from the wall with no electrical cords running between the bed and the wall. There should be no bed skirt or other bedding touching the floor. If climb up interceptors are installed make sure they stay in place under the frame. Encasements need to remain on the bedding. If they get cuts or openings they should be replaced. There is no magic formula for treating bed bugs. Clutter is their best friend both because it gives them places to hide and because it prevents us from treating some areas, which then means the treatment will be unsuccessful. All the preparation above has to be done for treatment to be successful and it is senseless to treat if it is not. Never bring in used furniture. Half the cases we see are from that. Internet search motels for bed bug reports & reviews from other visitors. Inspect rooms you stay in for bugs and staining on mattresses. Leave luggage in garage & away from bedrooms when returning. Bring clothing back in plastic bags & wash before you bring back in. Store luggage in motels away from beds & put in drawtight plastic bags. Consider using duffel bag luggage that can be put in a dryer on return. Don't treat luggage with repellent chemicals when returning home. Be aware of visiting guests & where they have been before your home. Get encasements for your beds at home for detection & prevention on return. Here's an interesting believe it or not! Bed bugs have a fearsome enemy: the bean plant. Traditionally, Eastern Europeans filled their bedrooms with bean plant leaves, which trap bed bugs with tiny hook-like hairs, then burned the leaves the next morning. Inspired by this custom, scientists are studying bean plants’ ability to deter bed bugs in modern-day societies, The leaves’ success inspired scientists to try to create synthetic bed bug traps modeled after the bean plant leaves using epoxies. But the synthetic traps did not work as well as the natural ones: it took the bugs 39 steps on average to get stuck. Even then, the synthetic hairs did not pierce the bugs’ carapaces, and they usually escaped. The scientists are now refining their design to improve the device’s performance. University of California, Irvine, biologist Catherine Loudon and colleagues looked at bed bugs trapped on bean plants using video and an electron microscope, and found that the leaves were covered in small hooked hairs, which pierced the thin areas in the insects’ carapaces near their joints. On average, the bugs were trapped after just six steps on the plants. Flour mills and food processing plants in the United States and Canada now routinely incorporate heat treatments into their pest control strategy. 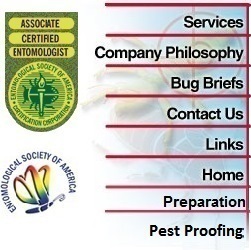 In fact, some North American facilities have used heat treatments to manage insect pest populations for more than 75 years. The process involves heating all or part of a facility to 120ºF - 140ºF for 20 to 36 hours. Treating residences with heat also has been around for a while and is really getting a lot of attention since bed bugs have come back on the scene. The process can be quite expensive depending upon how much preparation is required. Heat is pumped into a structure through ducts or with portable machines to raise room temperatures for a set time. Here are a few of my issues with heat treatments. If you have a problem in one or two rooms of a structure and you wish to treat those rooms only, how do you prevent the pests from migrating from those rooms as temperatures rise? The insects won't stick around while the room temperatures rise. If it takes professional food processing companies over twenty hours to kill their insects, how does an hour or two of high temperatures kill all of the insects hiding deep inside a couch or inside walls? To be fair, some companies do adhere to the guidelines. Just keep in mind that heat has to permeate through layers of fabric and cushion or through drywall and insulation to be effective. A "whole house" treatment can be expensive and disruptive. A small apartment treatment may cost in the range of $1,200 and with preparation, take up to eight hours. You have to remove perishable foods and goods like candles and sensitive electronics. Plasma TV's, pianos, and computers can be at risk. I would also ask a lot of questions about how the heat affects painted walls and wall paper. Some companies reduce these risks by holding temps below 120 degrees but several studies show bed bugs require higher temperatures for several hours in order to be reasonably successful at killing all stages. There have been reports that many museums have stopped using heat treatments because of damage to furniture and specimens. In many cases drawers containing insect and other specimens shrank, cracked and became distorted. The heat treatment side effects were due to moisture loss and shrinkage of the wood making the treatment unacceptable. Heat will kill insects, for sure. There are easier and less expensive methods to achieve the same results in many cases. I think using some low-toxicity pesticides and exclusionary steps would be a better alternative in cases of minor to moderate infestation. In cases of substantial infestation or where a lot of "clutter" exists, heat might be the appropriate solution. We are as savvy as an old dog but as eager as a puppy to serve you !